When Calamity lit up the sky, the Epics were born. David’s fate has been tied to their villainy ever since that historic night. Steelheart killed his father. Firefight stole his heart. And now Regalia has turned his closest ally into a dangerous enemy. David knew Prof’s secret, and kept it even when Prof struggled to control the effects of his Epic powers. But facing Obliteration in Babilar was too much. Once the Reckoners’ leader, Prof has now embraced his Epic destiny. He’s disappeared into those murky shadows of menace Epics are infamous for the world over, and everyone knows there’s no turning back. . . . But everyone is wrong. Redemption is possible for Epics—Megan proved it. They’re not lost. Not completely. And David is just about crazy enough to face down the most powerful High Epic of all to get his friend back. Or die trying. This is somehow my least favorite of the series but I do still love it so! I think it ended up being a lot of action and wasn't as much detail which is what I've come to know and love with Sanderson books so I was missing that just a bit. There was definitely more of that towards the end of the book and there were some pretty awesome reveals and conclusions! I loved where Sanderson took some of these abilities and the secrets behind Calamity. I actually would have loved just a SMIDGE more information but I thought it was really neat where it went. I think the first two books did such a great job setting this one up that I just really wanted a bit more development from this book (even though it was the last one) because I've loved the relationships, characters, and plot up until CALAMITY. Full review as originally posted HERE on The Book Addict's Guide 3/9/16: Brandon Sanderson is one of my favorite authors and after I binge read STEELHEART, FIREFIGHT, and even the MITOSIS novella, the wait for CALAMITY was rough! I wasn’t used to waiting for a new Sanderson book (I have a tendency to binge them since I just can’t get enough!) so I was incredibly excited for the conclusion to this fun and smart YA series! CALAMITY brought some of my favorite characters back! I adore David Charleston and he’s just so much fun. Even when things look bleak, he’s still got bad metaphors (well, actually similes) to cheer everyone up and he always seems to be quite positive about everything. I loved the tone that he brought to this series and how things always stayed humorous even in the darkest of times. The Reckoners crew is so much fun too. I still wasn’t as attached to new-comer (well, new in FIREFIGHT) Mizzy but I think that’s just because I have a hard time adjusting to new characters becoming a part of the main crew. I was really glad that more of Megan’s powers were explored and that CALAMITY really dug deeper into how they worked and why. CALAMITY was much more action-packed and fast-paced than the first two books. I think STEELHEART and FIREFIGHT still had quite a bit of action but CALAMITY seemed to be more focused on this final show-down between the Reckoners and the Epics than the first two installments. I did miss the classic Sanderson world-building and details in this book and it was fairly noticeable for me as I was reading. I’m so used to layers upon layers of details or clues being built into the book and then it all coming together in the end. Everything did still wrap up nicely but I was hoping that there would be just a touch more explanation and detail about Calamity (the Epic) and the formation of everyone’s powers. The answers were there but I was so hungry for more world-building! Maybe previous books have spoiled me since the Mistborn books are insanely detailed worlds. I really did feel a bit disappointed in the ending. I really liked where it was going, leading up to the answers of who/what/where Calamity is and why. I was just hoping for a bit more explanation once we got there. Sanderson is usually so good at pulling everything together and in such a stunning way and here I felt like things were not as carefully planned. The basic questions were answered but I still wanted to know so much more. We find out where Calamity is (other than burning out somewhere in the sky) but I still didn’t know where Calamity came from. We find out why the powers on Earth came to be but I still wasn’t quite sure why the motive to install them there (so to speak. Trying to word carefully to avoid spoilers!) was important. I feel like once the answers were provided, there needed to be even one MORE layer of world-building after that and I felt like the book didn’t quite go that ONE step further to really give a conclusion that closed all of the open doors. The book was enjoyable from start to finish and it never had a lull for me. The pacing was great, always moving things forward even when I didn’t know where they were going. I do still feel that small ping of disappointment though thinking how everything wrapped up. I’ve just become accustomed to Sanderson’s writing and how he crafted the Mistborn series (I have yet to read other series) and so I think my expectations were a little high for this conclusion. It was absolutely still a fun read but I did feel like there were still a few more loose ends that could have been tied. So, I ended up with a manuscript of CALAMITY (since there were no ARCs) and I started it but I also ended up waiting for the audiobook because that is how much I love MacLeod Andrews. I’ve reviewed his narration many, many times since I end up picking audiobooks specifically because he narrates them but I will reiterate how much I do love his voices. Males voicing females is always hard but no matter if it was David, Megan, Mizzy, Cody — each voice really felt individual and realistic. It’s more about the way that he forms a voice for a character even more than just choosing how their voice might sound. He adds so much character to each person and it really makes them come alive in the books. Obliteration was more nasal, Cody had a slight Southern accent, Abraham’s French-Canadian accent was fantastic — MacLeod Andrews really puts all those details in to each character. I also love when he adds human actions instead of just saying things like sniffles or gasps or sneezes. Those elements are also performed sometimes to really bring an extra layer of acting to the audiobook. I just love his performances and I’ll be picking up many, many more books narrated by him in the future. Calamity is the final book in The Reckoners' series. David is determined to try and save Prof by making him face his deepest fears in order to keep the darkness at bay. Even though his plan has promise, he is starting to doubt himself as his nightmares begin to be more and more vivid and persistent. And what about Calamity; it is clear now that rather than a thing, Calamity is an Epic. Will turning Prof help them to defeat Calamity? David's saving grace is still Megan who has faced her fears and is solidly by his side along with Mizzy, Abraham, and Cody, the only remaining Reckoners. The action is exciting and the relationship between the characters is well developed in this book. As in the first two books in the series, Sanderson poses questions to his readers. In this book, he looks at not only fear, but the nature and beauty of humanity and how it may be the strongest force of all. An excellent end to the Reckoners's series. Not as great as the other two but still a satisfying ending to the series about a future world where "superheros" rule cities with powers such as being able to flood everything, make everything too hot. etc. 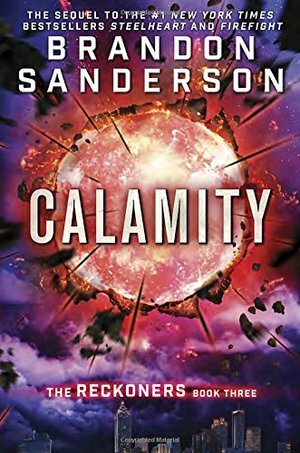 Calamity is the wrap up to the Reckoners Trilogy, and in characteristic style, Sanderson continues to amaze with his rules on magic/powers creating interesting characters and worlds. You are never quite sure how Sanderson is going to end one of his series, and after reading nearly everything else the man has written, there is always a portion of my mind spent watching for the foreshadowing to the big twist that all his fans know to be coming. Oddly, the ending of this one left me fairly disappointed. The buildup was great, the pacing matched all the other books in the series, with periods of studying the Epics, and then moving forward quickly in how they are going to deal with them. The ending seemed rushed in this one more than in any of the other Sanderson books that I have read. Not sure if it was page or word count restrictions, or just the amazing fact that he released two books in 5 weeks from completely different series, but the ending of this one fell kind of flat. For the ending of the series, it almost seemed to be a setup for another book that isn’t coming, and left me hoping for a novella or short story to better wrap up the situations created. I loved seeing how David was handling the responsibilities as leader of the Reckoners, and how they were going to handle battling their former boss and creator of the group. Firefight/Megan and David’s relationship continued to grow and was the primary source of levity in the book. The setting in a city of travelling salt provided some interesting backdrops and world building possibilities, but I found it to be just a bit tedious redo of the steel of Newcago in the first book, and the Waterworld in the second one. Overall, the first Sanderson book I would rate 4 out of 5 stars. I would recommend it for anyone that is wrapping up the series, but I don’t think that it will be bringing anyone new to the series. ** spoiler alert ** Not what I was expecting. Also, I was confused or dissatisfied with some of the developments: David was offered powers in Book 2, but appeared to refuse them, but still has access to them in times of high stress / mortality situations? How exactly did Tia die? What was the deal with Tivo from the other universe (Prof's daughter)? In another alternate universe his father is Steelheart? Calamity just curls up and his light goes out? The epic fight in the tunnels under Ildithia went on waaay too long, and I had a hard time orienting myself. And while I'm on about it, if the city rebuilds itself every seven days, and it is 10 miles across, it seems to be moving at a pretty good clip. Where is it going, and how extensive are those tunnels (i.e., why haven't they left the tunnels far behind)? I feel like this was an opportunity to create a lot of supers so the Reckoners could encounter them. Most of the characters didn't change, except for Megan who was able to explore her powers, but we never really heard much about it until she showed up with her uncountable alternate selves in the tunnels. Okay, that one scene was really pretty cool, but I probably won't remember it or this book after while.